December 15, 2017 10:52 am. 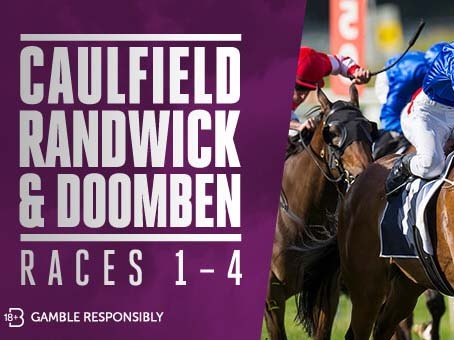 Crownbet is giving cash back if your horse runs second or third at the three major metro meetings this weekend — Caulfield, Randwick and Doomben. To be eligible for the offer you must place a fixed odds bet on races 1-4 at the three mentioned meetings; and if your horse finishes second or third you will get your stake back in bonus bets (up to the value of $50). This special at Crownbet applies to your first fixed odds bet on the nominated races. Other great horse racing promos running at this Crown Resorts-backed bookie, include bet boosts with your Crown Rewards points, Protest Payouts and Fair Go Refunds. For Friday night’s Moonee Valley meeting punters who place a win bet in races 1 and 2 can win a share in 20,000 Crown Rewards points, if their bet finishes second and third. * Applies to your first fixed odds win bet on each nominated race. * It excludes Best Tote plus and any other markets other than Fixed Odds, all in bets, NSW and SA residents, multibets, cashed out bets, phone bets and wagers placed with bonus bets. * Standard Crownbet terms and conditions apply.